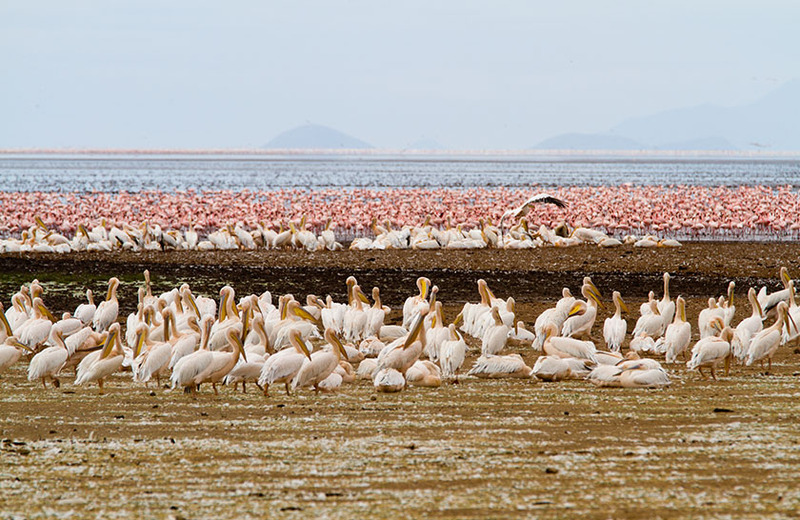 The alkaline soda of Lake Manyara is home to an incredible array of bird life that thrives on its brackish waters. Pink flamingo stoop and graze by the thousands colourful specks against the grey minerals of the lake shore. Yellow-billed storks swoop and corkscrew on thermal winds rising up from the escarpment, and herons flap their wings against the sun-drenched sky. Even reluctant bird-watchers will find something to watch and marvel at within the national park. Lake Manyara’s famous tree-climbing lions are another reason to pay a visit to this park. The only kind of their species in the world, they make the ancient mahogany and elegant acacias their home during the rainy season, and are a well-known but rather rare feature of the northern park. 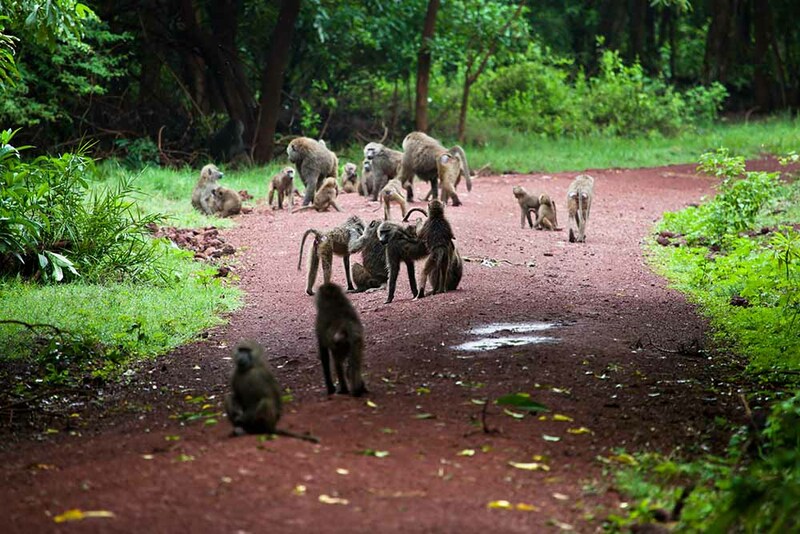 In addition to the lions, the national park is also home to the largest concentration of baboons anywhere in the world — a fact that accounts for interesting game viewing of large families of the primates. 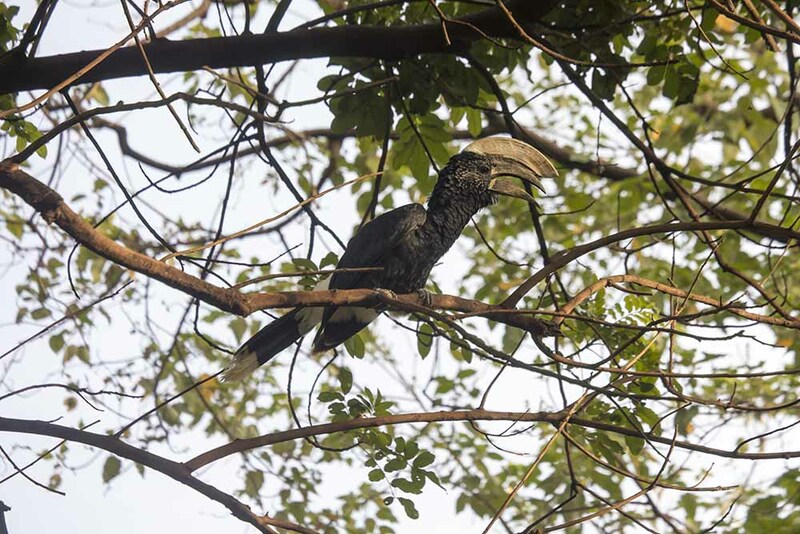 From the entrance gate, the road winds through an expanse of lush jungle-like groundwater forest where hundred-strong baboon troops lounge nonchalantly along the roadside; the blue monkeys scamper nimbly between the ancient mahogany trees; dainty bushbuck tread warily through the shadows, and the outsized forest hornbills honk cacophonously in the high canopy. 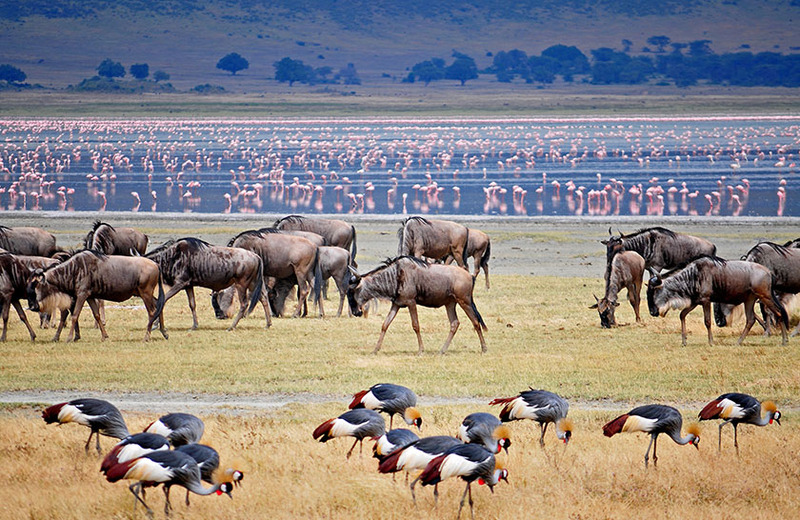 In contrast with the intimacy of the forest, is the grassy floodplain and its expansive views eastward, across the alkaline lake, to the jagged blue volcanic peaks that rise from the endless Maasai Steppes. Large buffalo, wildebeest and zebra herds congregate on these grassy plains, and so do the giraffes – some so dark in coloration that they appear to be black from a distance. 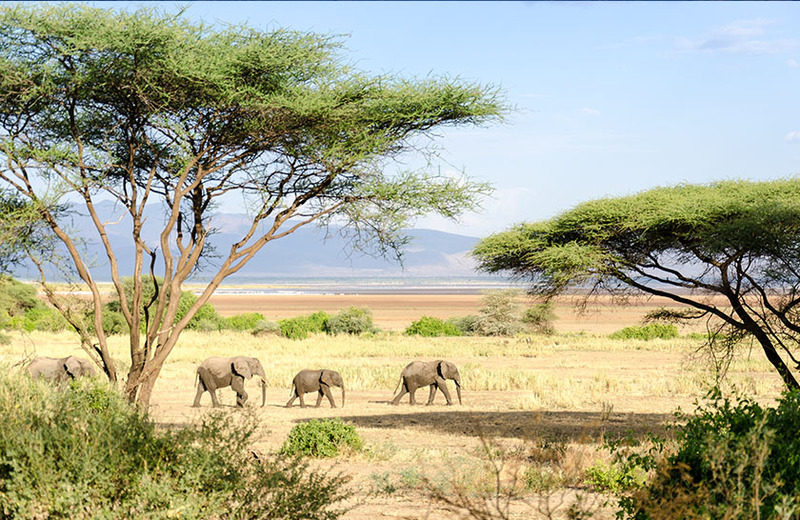 Inland of the floodplain, a narrow belt of acacia woodland is the favoured haunt of Manyara’s legendary tree-climbing lions and impressively tusked elephants. Squadrons of banded mongoose dart between the acacias, whereas the diminutive Kirk’s dik-dik forages in their shade. Pairs of klipspringer are often seen silhouetted on the rocks above a field of searing hot springs that steams and bubbles adjacent to the lakeshore in the far south of the park.